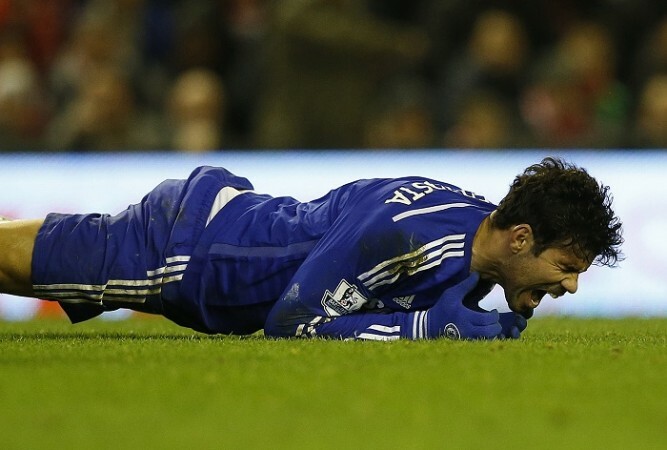 Chelsea striker Diego Costa sustained a hamstring injury during his side's 2-1 win over Stoke City. Chelsea have been dealt a bitter blow following news that their striker Diego Costa is facing a minimum of two weeks on the sidelines after sustaining another hamstring injury during his side's 2-1 win over Stoke City on Saturday. The Brazilian-born striker was pulled out of Spain's international games against Ukraine and Holland after he had suffered a strain on his left hamstring during Blues' win at Hull City last week. The Chelsea medical staff was confident that the player had recovered and this resulted in manager Jose Mourinho including Costa for Blues' clash against Stoke City. The Spain striker started from the bench against the Potters and was introduced at half time when the score was 1-1. However, he lasted for only 11 minutes as he picked up yet another hamstring strain. Although the 26-year-old striker is scheduled to undergo another scan, the Chelsea boss says that he is certain that Costa will be out for a minimum of two weeks. "It's too early [to say how long he will be out]. He has to go home, wait 48 hours and do all the scans again. He will be out for sure for a couple of weeks. We have seven weeks and eight matches until the end of the season, so for sure for half of it he has to be with us," Mourinho told Chelsea's official website. The Portuguese insists that he was not taking a gamble playing Costa as he and the medical department were convinced that the player was "ready". "I wouldn't say it was a gamble playing him because we did every test, and the muscle was clear. The player trained two days, 100%. The medical department was convinced he was ready. The player was convinced he was ready, not to play for 90 minutes but to help the team if needed," the former Porto boss told the Guardian. However, Mourinho insists that he is not putting any blame on Chelsea's medical department. "A [play it] safe medical department can't work with me - a department which says an injury of two weeks needs one or two months cannot work with me; people with fear who cannot take risks cannot work with me. They are fantastic but today, between them, the player and myself, things didn't happen the best way.